Ski transfers from Genève Aèroport (GVA) to winter sport resorts in Valais and Vaud in Switzerland are usually done by train and bus but private shuttle bus services are also available. Getting from Geneva Airport (GVA) to Swiss ski resorts is easy by public transportation. Swiss Railways’ trains stop at the airport station in the basement of the terminal building and provide regular trains to the base stations in the Rhone Valley from where skiers generally travel by local train or bus into the mountains. In contrast to transfers to French ski resorts, regular shuttle bus services are rarely available from Geneva Airport to Swiss winter sport resorts. Private airport shuttle services can of course be reserved in advance but compare rates before making reservations. Taxi2Airport and Suntransfers give easy online quotations. without first requiring flight or personal details. 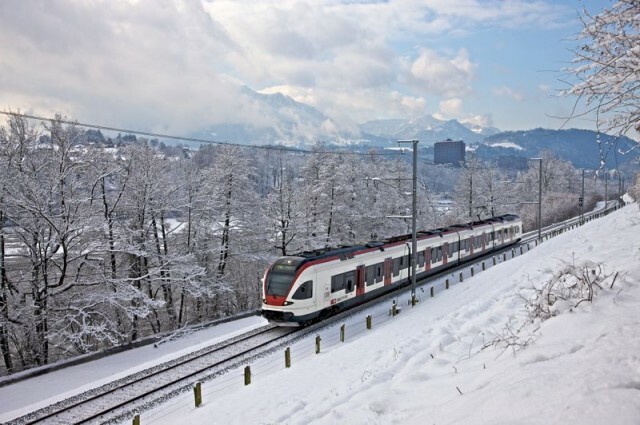 Public transportation from Geneva Airport to ski resorts in the Alps of Vaud and Valais usually starts with a train ride to base stations in the Rhone Valley from where local train and buses take skiers up to the mountain stations. Timetables and tickets are available online from Swiss Railways – use the abbreviation GVA to get Genève-Aèroport train station. Buy tickets before boarding trains in Switzerland – or pay a CHF90 surcharge – and do not put bags, jackets, etc on seats at busy times – or buy a half-price ticket for the seat used for luggage. Inter-Regio (IR90) trains generally depart twice per hour from Geneva Airport to the Rhone Valley in Valais (Wallis). The trains are usually direct but occasionally – mostly very early morning or late at night – transfers may be required at Lausanne or Geneva-Cornavin station. Transfers to local train may also be required for travel to smaller stations. The IR trains are reasonably comfortable but seat reservations are not possible and food or drink are usually not sold on the trains. 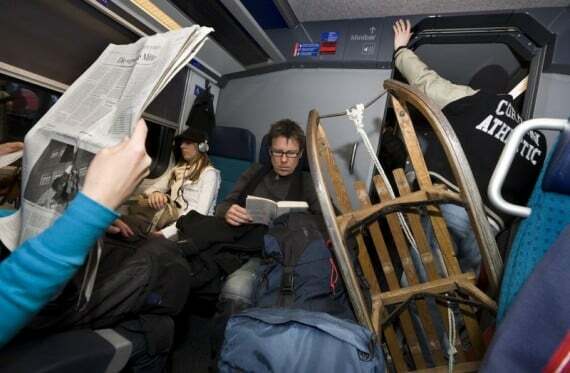 There is no real limit on the amount of luggage and ski equipment carried, as long as a seat is not used for luggage during busy times. Swiss public transportation is reliable but not particularly cheap, but generally cheaper than private alternatives. However, many savings deals are available but unfortunately it is a bit of effort to work out which deals are worth pursuing. The Swiss Railways website offers not only timetables but also prices and tickets for most trains and bus services in Switzerland. All international passes and travel cards are also available here at the cheapest rate on the market – some tickets are only on sale outside Switzerland. A simple one-way ticket from Geneva Airport (GVA) in second class is around CHF103 to Zermatt, CHF72 to Crans-Montana, or CHF66 to Verbier. (Return is simply twice the one-way fare, no discounts.) Children 6 to 16 pay half the adult fare but a Junior Card (CHF30) is worth the price if going further than Verbier or planning any further travel in Switzerland. Skiers going further than Verbier can usually save by using the Swiss Transfer Ticket, which provide return transportation from Geneva Airport to the ski resort for CHF154 (second class). Own children (aged 6 to 16) can be added for free to this ticket – then called Swiss Family Card – but this must be done at the time of purchase. See Save with the Swiss Card and Transfer Ticket for more details on these special international ticket deals. The Swiss Transfer Ticket must be bought outside Switzerland – the easiest is through Swiss Railways or RailEurope but many travel agents also sell the ticket. The Swiss Card is simplest bought in advance too but is available at Geneva Airport. International Savings Passes and Travel Cards for Swiss Public Transportation – an overview of the rather confusing number of special deals available to international tourists. Taxi2Airport for online pre-booked transfers.